The major city is Anchorage. 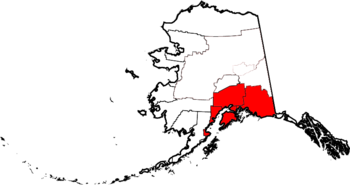 Other towns include Palmer, Wasilla, Kenai, Soldotna, Homer, Seward, Valdez, and Cordova. The climate of Southcentral Alaska is subarctic. Temperatures range from an average high of 65°F (18°C) in July to an average low of 10°F (-12°C) in December. The hours of daylight per day varies from 20 hours in June and July to 6 hours in December and January. The coastal areas consist of temperate rainforests and alder shrublands. The interior areas are covered by boreal forests. Southcentral Alaska contains several dormant and active volcanoes. The Wrangell Volcanoes are older, lie in the East, and include Mount Blackburn, Mount Bona, Mount Churchill, Mount Drum, Mount Gordon, Mount Jarvis, Mount Sanford, and Mount Wrangell. 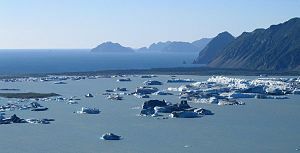 The Cook Inlet volcanoes, located in the Tordrillo Mountains and in the north end of the Aleutian Range, are newer, lie in the West, and include Mount Redoubt, Mount Iliamna, Hayes Volcano, Mount Augustine, Fourpeaked Mountain and Mount Spurr. Most recently, Augustine and Fourpeaked erupted in 2006, and Mount Redoubt erupted in March 2009, resulting in airplane flight cancellations. Wikivoyage has a travel guide for Southcentral Alaska. ^ a b "Travel Information on South Central Alaska". 2006. Retrieved 22 April 2011. ^ "Travel Alaska - Alaska's Climate - Southcentral". Retrieved 22 April 2011. ^ "Ecosystem and Climate History of Alaska". Geology and Environmental Change Science Center. Retrieved 22 April 2011. ^ Gates, Douglass. "Great Land of Alaska: Alaskan Mountain Ranges". Retrieved 22 April 2011. ^ "Volcanoes of Southcentral Alaska". Retrieved 22 April 2011. ^ Mauer, Richard; Demer, Lisa (28 March 2009). "Redoubt ash dusts Anchorage, airport closed". Anchorage Daily News. Retrieved 22 April 2011.